By Adam J. Fein, Ph.D.
Editor’s note: This article was written by Adam J. Fein, Ph.D., CEO of Drug Channels Institute (DCI). He is one of the country’s foremost experts on pharmaceutical economics and the drug distribution system. Dr. Fein’s popular and influential Drug Channels blog is the go-to source for definitive and comprehensive industry analysis, delivered with a witty edge. The article is adapted from DCI’s 2018-19 Economic Report on Pharmaceutical Wholesalers and Specialty Distributors—the most comprehensive, non-partisan tool for building deep business acumen about the economic and business realities of U.S. pharmaceutical distribution. The report contains the latest industry and financial data, along with detailed information about the strategies and market positions of the largest public companies: AmerisourceBergen, McKesson, and Cardinal Health. Click here to download a free report overview. Three companies account for more than 90 percent of all revenues from drug distribution in the United States: AmerisourceBergen Corporation (NYSE:ABC), Cardinal Health, Inc. (NYSE:CAH), and McKesson Corporation (NYSE:MCK). We estimate that in calendar year 2017, U.S. revenues from the drug distribution divisions of the Big Three wholesalers reached $425.1 billion, a 4.5 percent increase over the 2017 figure. (See table below.) Wholesalers’ combined share of the market has grown in recent years, from 87 percent in 2013 to 92 percent in 2017. This growth occurred due to acquisitions of smaller companies and a shift by large retailers to purchasing generic drugs via wholesale distribution. 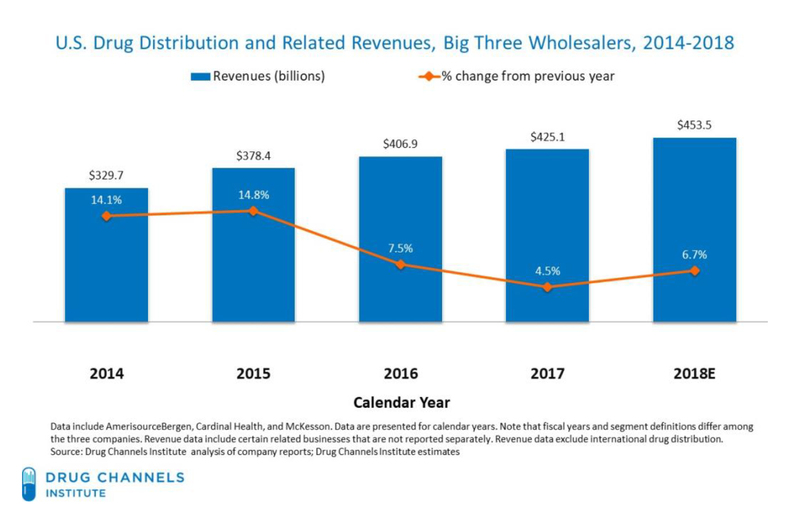 The chart below shows total revenues since 2014 for the Big Three wholesalers’ total U.S. drug distribution businesses. We project that the companies’ combined drug distribution revenues will reach $453.5 billion in 2018, a 6.7 percent increase from the 2017 figure. This will exceed the overall market’s growth, due to the inclusion of acquired smaller companies—particularly H.D. Smith and BDI Pharma—in the company totals. Note that these figures include sales of traditional, specialty and generic drugs. To facilitate comparisons, we present the summary financial information on a calendar-year basis, although each of the three large wholesalers reports financial results using different fiscal-year schedules. Other regional and specialty wholesalers include: Capital Wholesale Drug Co., Dakota Drug, Prescription Supply and Value Drug. The Big Three companies have acquired many regional and specialty wholesalers within the United States. Noteworthy transactions in the past year include McKesson’s acquisition of BDI Pharma and AmerisourceBergen’s acquisition of H.D. Smith. Full-line wholesalers purchase, inventory and sell a manufacturer’s complete pharmaceutical product line unless otherwise designated. They service a diverse set of pharmacy outlets. These locations include outpatient outlets (such as independent drugstores, chain drugstores, supermarkets with pharmacies, mass merchants with pharmacies and mail pharmacies) and institutional, non-retail healthcare facilities (such as hospitals and physician offices). Retail, mail and specialty pharmacies account for three-quarters of full-line wholesalers’ revenues. This share has been consistent for many years. Specialty distributors sell specialty pharmaceuticals primarily to physician-owned/operated clinics, hospitals and hospital-owned outpatient clinics. Independent physician offices and outpatient clinics remain the largest customer group for specialty distributors. These sites are privately owned, community-based centers that have office space as a direct cost to the physician and not typically in a hospital outpatient department area. Specialty drugs are sold both by full-line wholesalers and specialty distributors. We estimate that in 2017, specialty drugs accounted for more than 30 percent of full-line wholesalers’ revenues. Specialty drugs accounted for nearly all of specialty distributors’ revenues. The biggest specialty distributors are divisions of the Big Three wholesalers. These include the distributors owned by AmerisourceBergen (Oncology Supply, ASD Healthcare, and Besse Medical), Specialty Solutions (a business unit of Cardinal Health), and McKesson Specialty Health (a business unit of McKesson Corporation).